A few of my favorite wedding bouquets from 2014. It has been a wonderful year serving the beautiful brides of Southern Tennessee and Northern Georgia. With four weddings already booked for next spring and another Pink Bride show coming up in 6 weeks, I'm heading into 2015 excited about all the wedding days I'll be making a little more beautiful next year! Flowers by Tami McAllister in Chattanooga, Red Bank, Hixson, Signal Mountain, Jasper, Dunlap, Pikeville, Cleveland Tennessee. Chickamauga, Fort Oglethorpe, Lookout Mountain, Georgia. In preparation for the July Pink Bride show, I drove down to my favorite wholesaler in Atlanta to hand select some beautiful flowers to work with. Here are some photos of what I created with those flowers and how I displayed them in my booth. I had the opportunity to attend an "Art and Design Demonstration" in Atlanta a couple of weeks ago. The presenter's name was Joseph Massie. He is 26 year old, from the UK, and has won gold medals in the Chelsea Flower Show for the last 5 years in a row. These type of design shows are such an inspiration! I left at the end of a lovely afternoon full of ideas and new knowledge about great techniques to try. Of course I took plenty of pictures so I can share the beauty (and remember the ideas and techniques I so admired)! My personal favorite. This is made out of preserved roses! 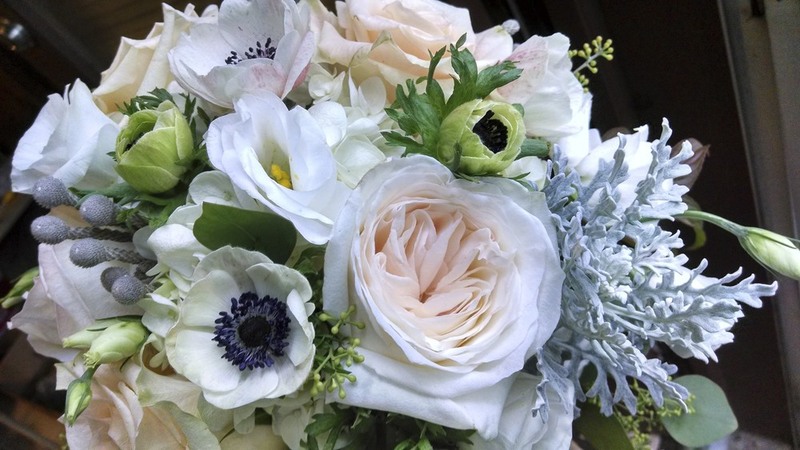 A super lightweight, absolutely stunning bouquet that will last forever. I hope I get the chance to make one soon. Woven grass balls with water tubes and poppies. Loved this permanent container type piece created out of lichen covered sticks. 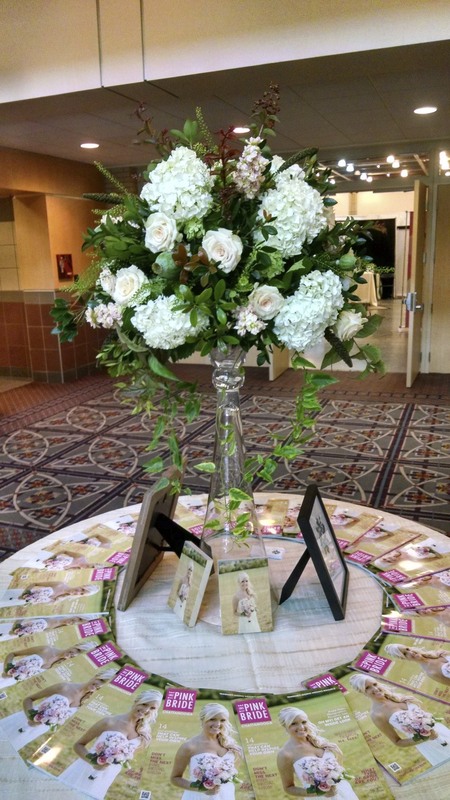 Classic style table scape with beautiful silver containers, ivory, white and green flowers. Similar to my classic style I think, but a bit messier. More of an art piece design. I love the texture and lines. I can't imagine spending that amount of time, unless it was made with permanent botanicals though. Definitely more of an art installation type piece, which I can't imagine having the time for... very showy though. Handbag styles that could work as something different for bridesmaids. I liked his technique for wiring sticks to lay over top of bouquet. I love simple, contemporary designs that complement the container(s) they are in. Detail shot. Love the massed brunia giving a bubble like texture. Entrance tabe piece. 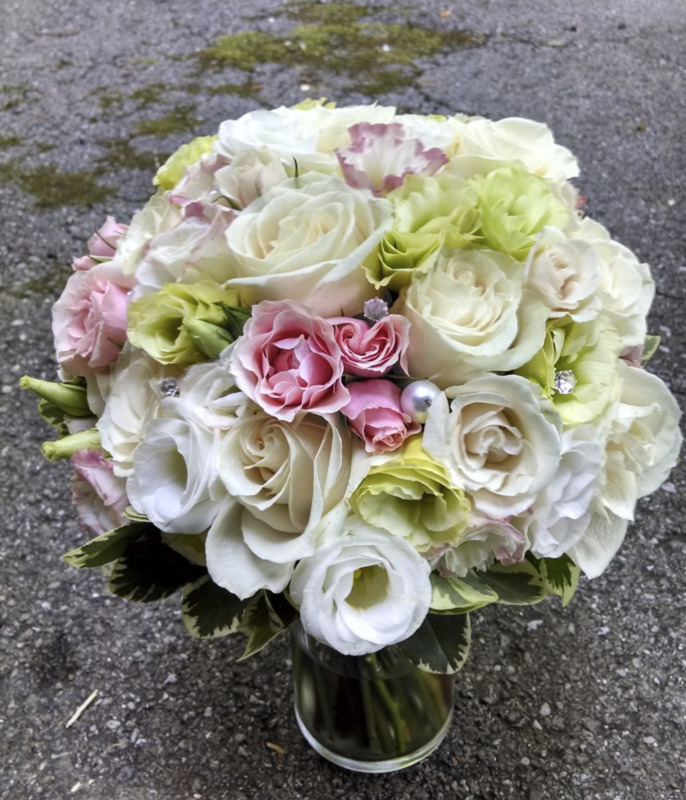 Sahara Roses, white Delphinium, green Hydrangea and Amaranthus. 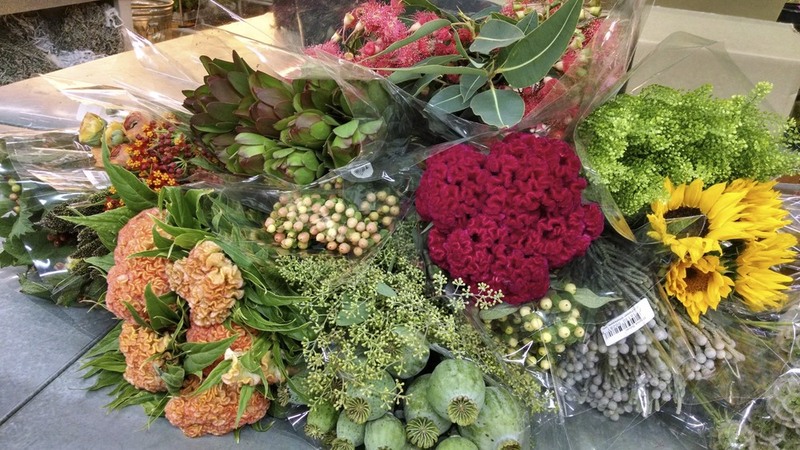 Green Lotus pods, Roses, Amaranthus, Succulents, Dahlias and fiddle-head Ferns. I've been working in the floral industry for 11 years and have done the flowers for over 200 weddings. 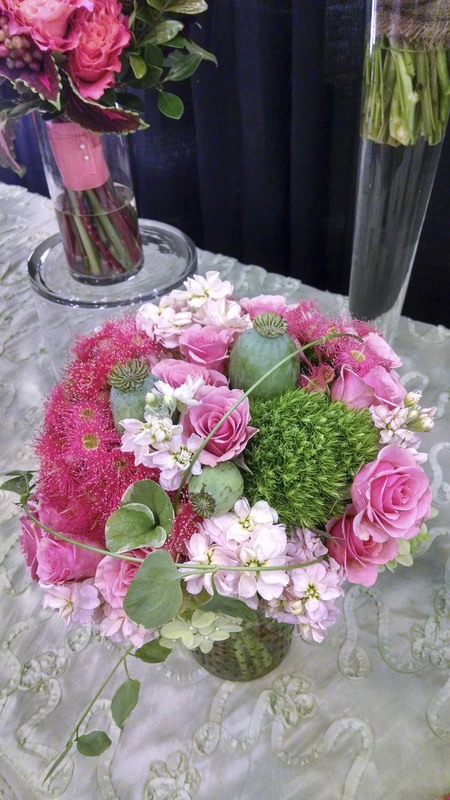 I finally started my own business at the beginning of 2014 and made my debut as "Flowers by Tami" at the Pink Bride show on January 5th at the Chattanooga Convention Center. It was a very successful show! In the 5 weeks since, I have met with eight brides and have deposits down on my first 5 weddings for this season. I think this is a wonderful start and I am looking forward to working with many Chattanoogan brides this year and in the years to come! Succulents, Roses, Stock, Babies Breath, dried Lotus Pods. Garden Roses, Freesia, seeded Eucalyptus, Dusty Miller, Scabiosa seedpods. My booth. Centerpiece in corkwood container with green Roses, purple Stock, white Lilac, green Dianthus and Camellia foliage. An Instagram photo I took of the purple double fringed Tulips several days after the show. The main show piece in my booth. A large scale arrangement, upraised on a reflection vase from accent decor. Purple Stock, double fringed Tulips, Dendrobium Orchids, white Roses, green Hydrangeas, dried Lotus pods, Camellia foliage, Dogwood branches. I absolutely LOVE doing the flowers for other peoples big, beautiful, glorious weddings! But when It came to my own wedding - simple, natural, beautiful, and completely stress free is what we were after! Having both been married with the large traditional weddings in the past, we were after simply "making it official", but with a bit of our own personal flair. The great outdoors, nature and everything beautiful in nature is what we are all about - hence my lifelong passion for flowers and floral design! I went for a walk on my in-law's property in Tellico Plains a couple of hours before the ceremony and gathered what natural beauty I could find to create my wedding bouquet. This last minute, all natural bouquet included an assortment of fall leaves, laurel leaves and pine, moss, pinecones, nandina berries, beauty berries, a single green hydrangea and a few sprigs of salvia. We privately said our own vows to each other in a beautiful spot near Bald River Falls. It was a perfectly simple, romantic, stress free event!